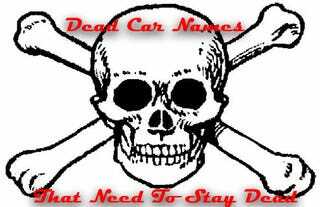 Which Dead US Automotive Nameplates Should Remain Buried? Seems the boss-man has been moonlighting again over at Popular Mechanics, this time advising Detroit about which of its dead nameplates should remain six feet under. We won't give away Ray's picks; you'll have to head over to PopMech for those, but we've tossed our own version together after the jump. There's a malt liquor called Laser. It's about as refreshing to a college thirst as a pint of warm vinegar, but it does the job. Pretty similar to the Plymouth Laser actually. If Jeep considers reusing the name "Jeepster," that means the lately questionably off-road brand is considering a car-like Jeep, and that's stupid. We actually think the original Jeepster is pretty cool; our only reason for nominating this one is because Jeeps should never have been so city-fied. As much as we love the Fairmont police cars of the past, and the name does conjure up images of fair mountains, it's one that needs to stay buried. This one makes the list if only to discourage Ford from it's ridiculous and annoying "F" naming penchant. We know, GM, you're tempted to relive those halcyon days of 2001 when you besmirched an entire ancient civilization by unleashing the Pontiac Aztek upon the public. Quetzalcoatl will rain down destruction upon you should it ever make a return.